Preheat the oven to 375°F. 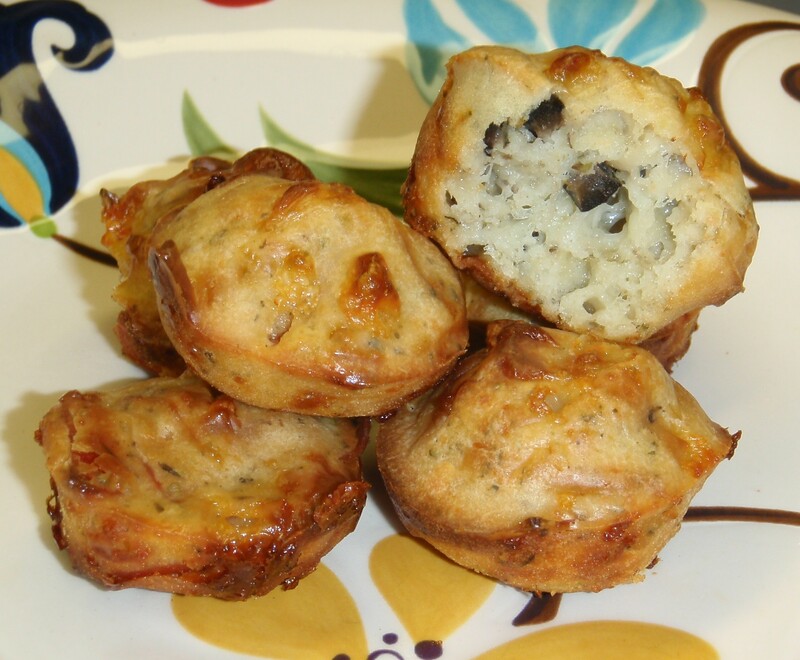 Grease a 24 cup mini-muffin pan or regular 12 cup muffin pan. Set aside. In a large bowl, whisk together flour, baking powder, Italian seasoning, salt, and red pepper flakes (if using) ; whisk in milk and egg. Stir in mozzarella, parmesan and pepperoni; let stand for 10 minutes. Stir the batter and divide among the muffin cups. Bake until puffed and golden, 20 to 25 minutes. All of my batter did not fit into the 24 cup mini-muffin pan, so I made a full-size muffin with the leftover batter. Some pans are larger than others so you may not have an issue. 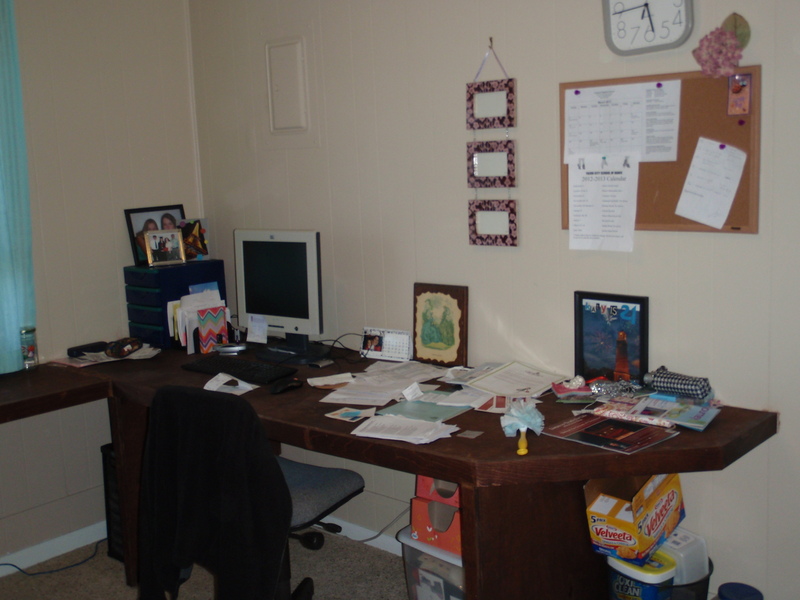 Today I wanted to share with you a project I did a few months ago that I just kept forgetting to write about: I decided to finally do something about my messy desk. It’s the only thing in my house I can’t seem to keep organized, and it drives me CRAZY! 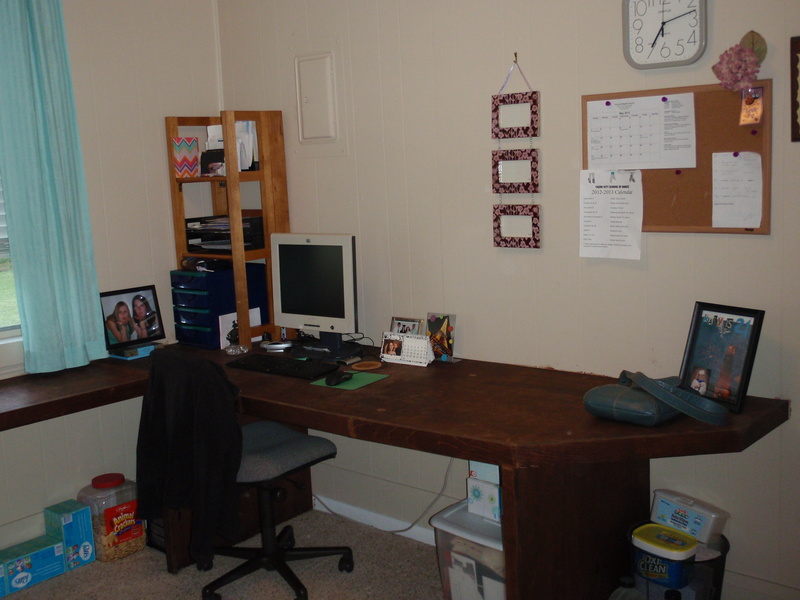 Russell’s side of the desk was designed as a computer desk and has a built-in shelf above his monitor. 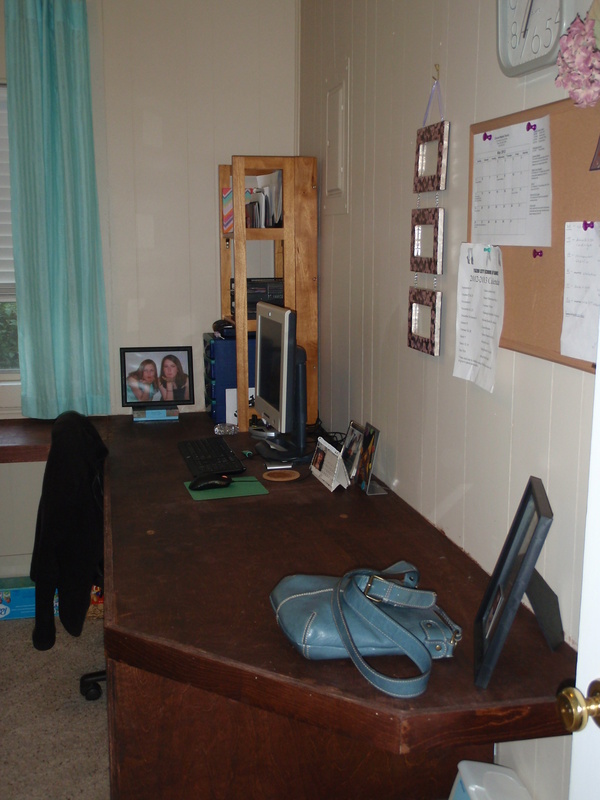 My side of the desk was designed as a craft desk, with no built-in shelf, and a computer was added later. My desk was sorely in need of organization but with no real solutions – not really possible to add a built-in shelf and couldn’t find a good desk organizer for a good price. 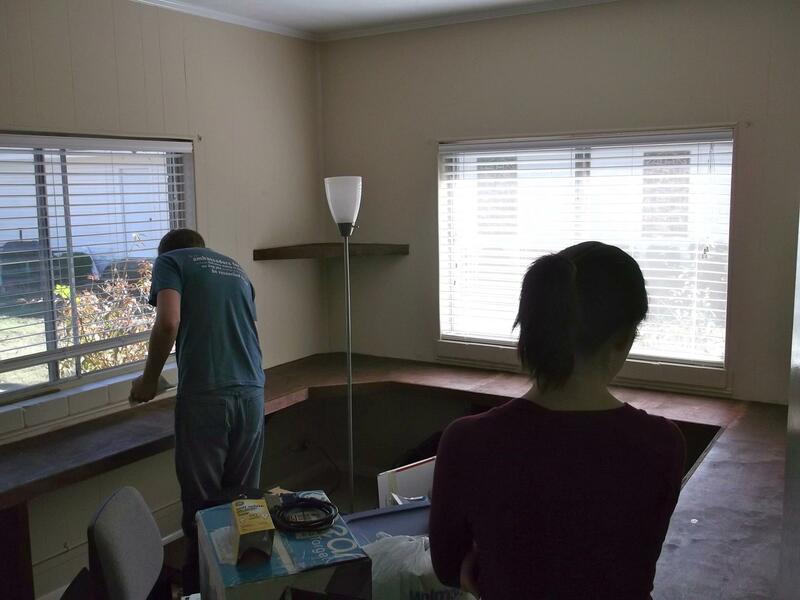 This is when we were building the desk (November 2011). Russell’s side is on the left, mine is on the right. Well, back in March I discovered any easy solution that didn’t involve much work or spending any money: a small shelving unit that I had brought home from my parents’ place over Christmas break. I had intended to use it as an extra bookshelf in our home office, but it didn’t fit next to the bookshelf we already had. I also added a few plastic organizers – drawers for pens, desk supplies, etc; desk tray for random papers; and a letter sorter. 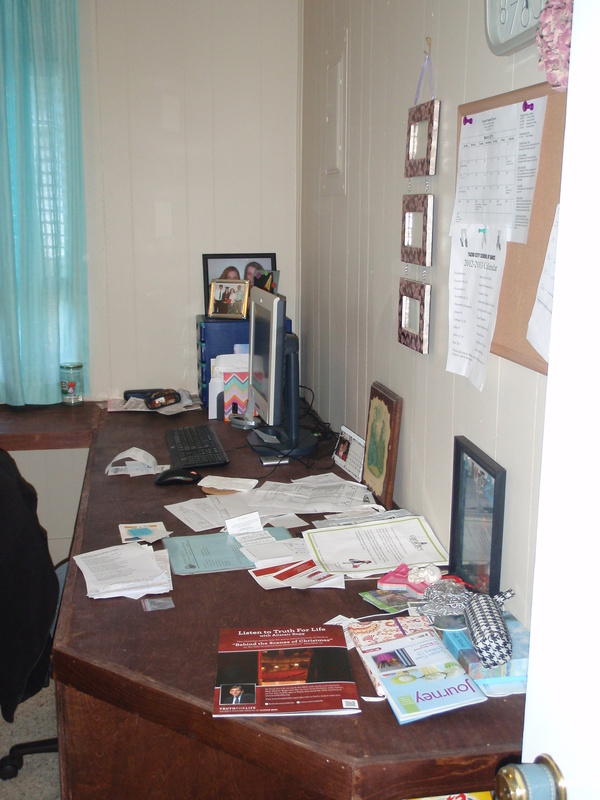 All of these I items I already owned or borrowed from Russell’s office at the church (he wasn’t using them, so I did). 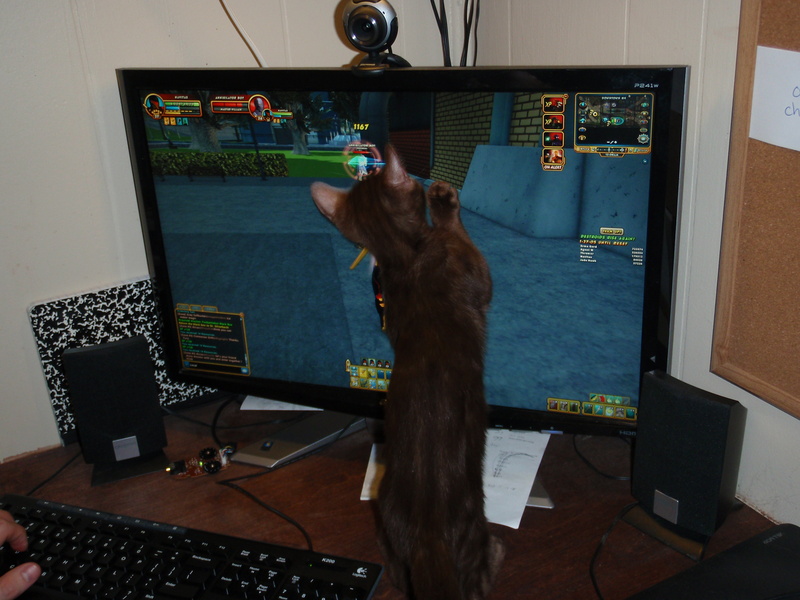 If you are curious why there are a bunch of tissue boxes lined up against the wall, it is because a certain little kitty named Malcolm used to chew on the ethernet cord. This shelf has already been recycled many times. It started out as an end piece for my college apartment’s kitchen bar. When I moved out of that apartment my brother used it as a bookshelf next to his desk. Now it holds all the items that would otherwise be piled up on my desk. I love finding easy solutions like this that don’t require spending any money! 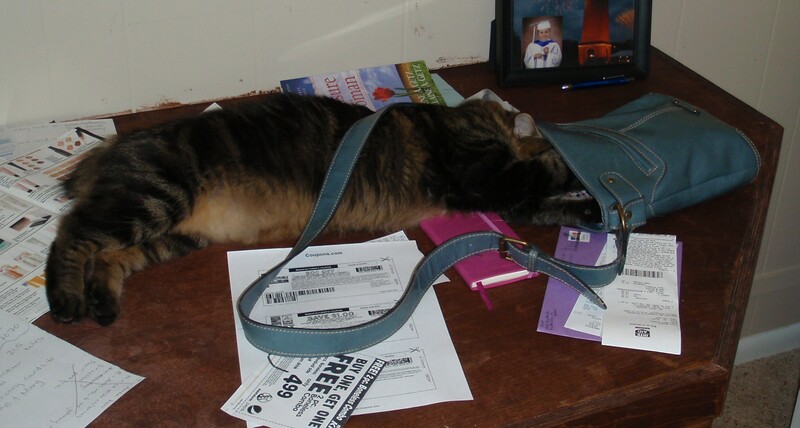 Tiger the pick pocket – caught red-pawed! 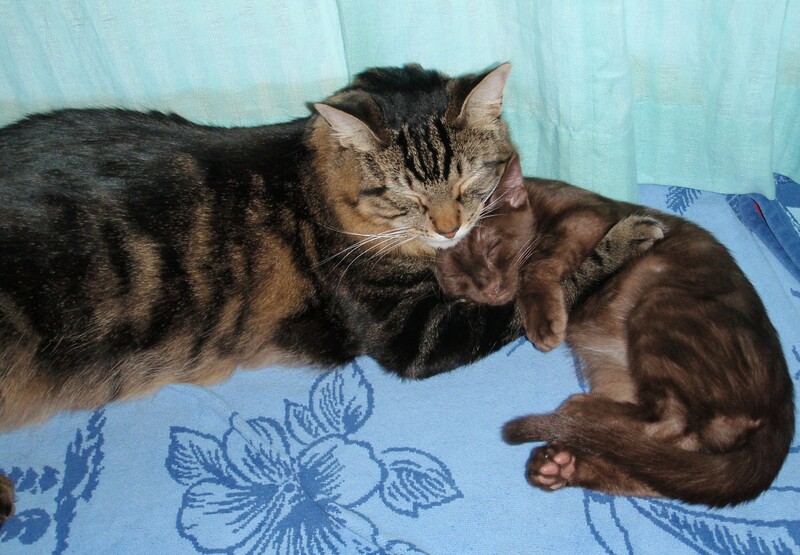 Tiger and Mal consoling each other after having to take a bath. Mal helped Russell kill the bad guy. 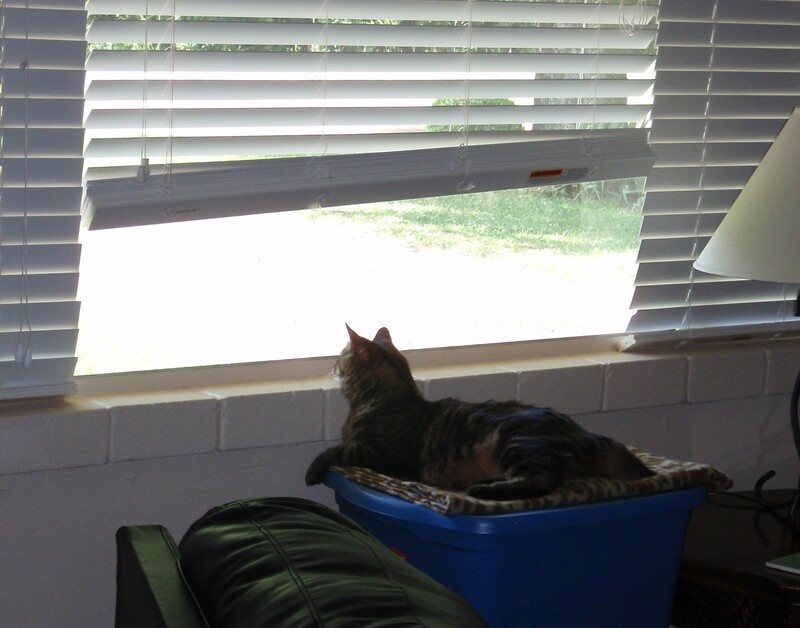 Tiger’s favorite window seat. He likes to rest his head on the sill and watch the birdies (we have a feeder right outside the window). I am not a fan of muffins because they are typically sweet. (I have the opposite of a sweet tooth; I have a salty tooth.) But I found these non-sweet muffins quite tasty, probably because they are more like biscuits than muffins. I was a little nervous about trying this recipe because it is written in metric units (and I’m terrible at math), but the conversion part was solved for me when I remembered that the digital kitchen scale Russell got me for my birthday has both ounces and grams. Preheat oven to 325°F/ 170°C/ gas mark 3. Spray a muffin pan with non-stick baking spray. Set aside. Melt butter in a sauté pan; add chopped onion and cook until soft and browned. While onion is sautéing mix together flour, baking powder, and cayenne pepper in a large bowl. In a separate small bowl whisk together egg and milk. Add egg mixture to dry ingredients; stir to combine. Chop the spinach into small pieces. Add both cheeses, spinach, and onion to ingredients in the large bowl and stir to incorporate. You may need to add a couple splashes of milk if the batter is too dry or won’t mix well. Kitchen Tip: An easy way to chop spinach – stack several leaves on top of each other. Cut into strips, then rotate 90 degrees and slice again. Run knife through pieces a few more times until you achieve desired size of pieces. Scoop into muffin pan using an ice cream scoop (this gives them a nice rounded shape). The muffin cups should be at least ¾ full. The batter will be very dense, more like biscuit dough, and the muffins will not rise much in the oven. 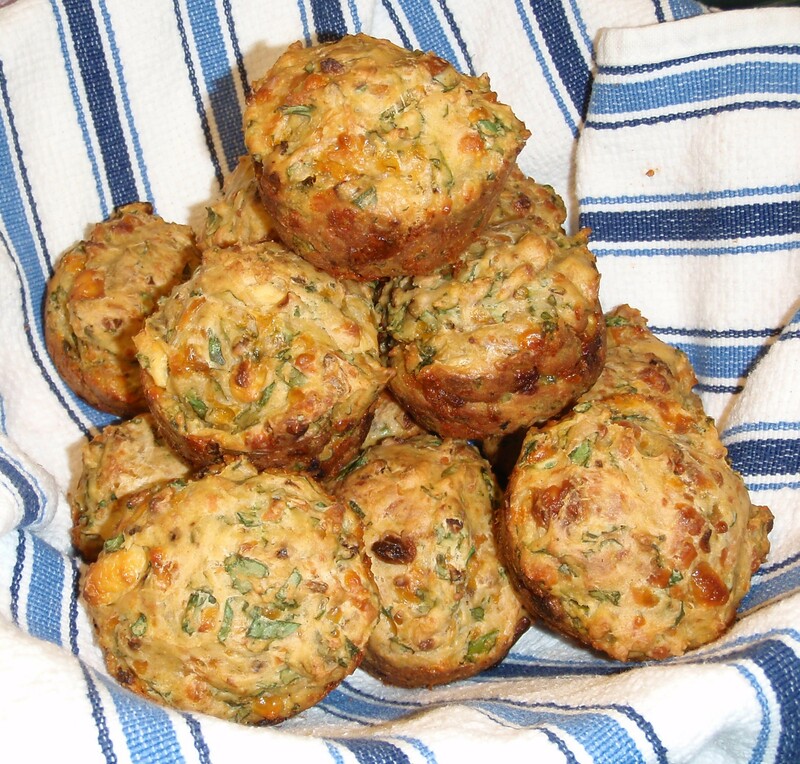 Though cayenne is usually a spicy ingredient, in these muffins it just kicks up the flavor (but without the heat). The amount of chopped spinach called for is 2 ½ cups, but I only used 1 ½ cups of chopped spinach because I didn’t think an extra cup would actually mix into the batter. 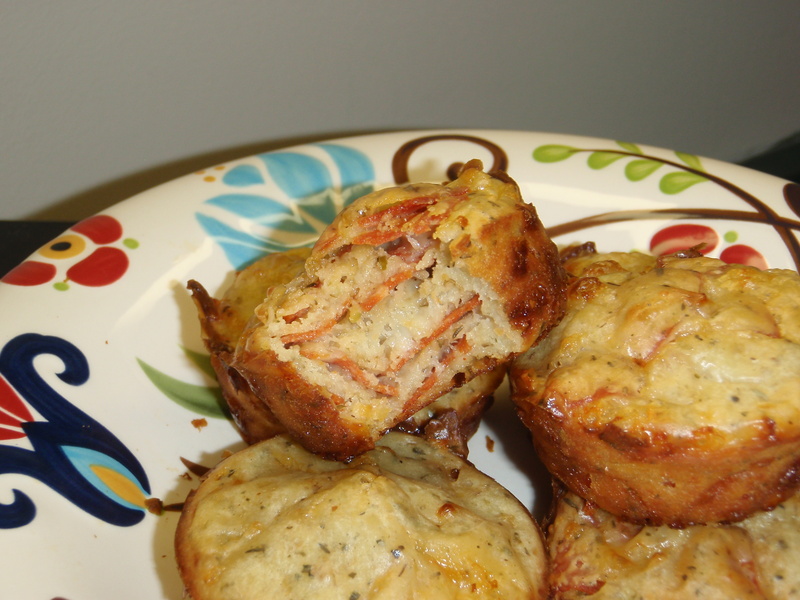 I do not recommend using muffin cups for this recipe because the muffins will stick to the paper. This tip comes from the kitchen of Simply Healthy Family. Turn to speed 4-6, and in 20 seconds you will have perfectly shredded chicken! 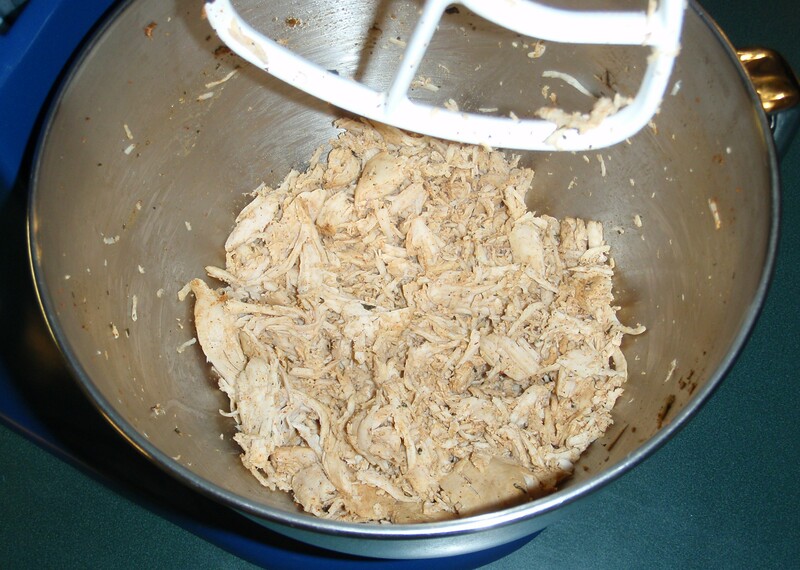 The last time I shredded chicken this way I put in 4 small-medium breasts (shown in photo above) at speed 4, and my mixer started to shake a bit and make an odd noise. I had to lower it to speed 2 to finish shredding the chicken. I have tried this trick before and had no problems, though I can’t remember how many pieces of chicken I put in the bowl, so I’d recommend sticking with three medium-sized pieces at a time. Now you can use this tip when you make Lime Chicken Taco Bowls, White Chicken Enchiladas, or any other recipe requiring shredded chicken! This is a super easy slow cooker meal that requires very little prep work (either before or after the slow cooker has done its job). Most people associate citrus with summertime so this dish presents itself as being a great summertime meal. Spray slow cooker with non-stick cooking spray. Place chicken on the bottom of the slow cooker. Combine lime juice, chili powder, and cilantro; pour over chicken. Turn chicken to coat in marinade. Cover and cook on low: 3 hours for a 5 quart crock, 5-6 hours for a 3 quart crock, or until chicken is cooked. Remove chicken, shred, and return to slow cooker. 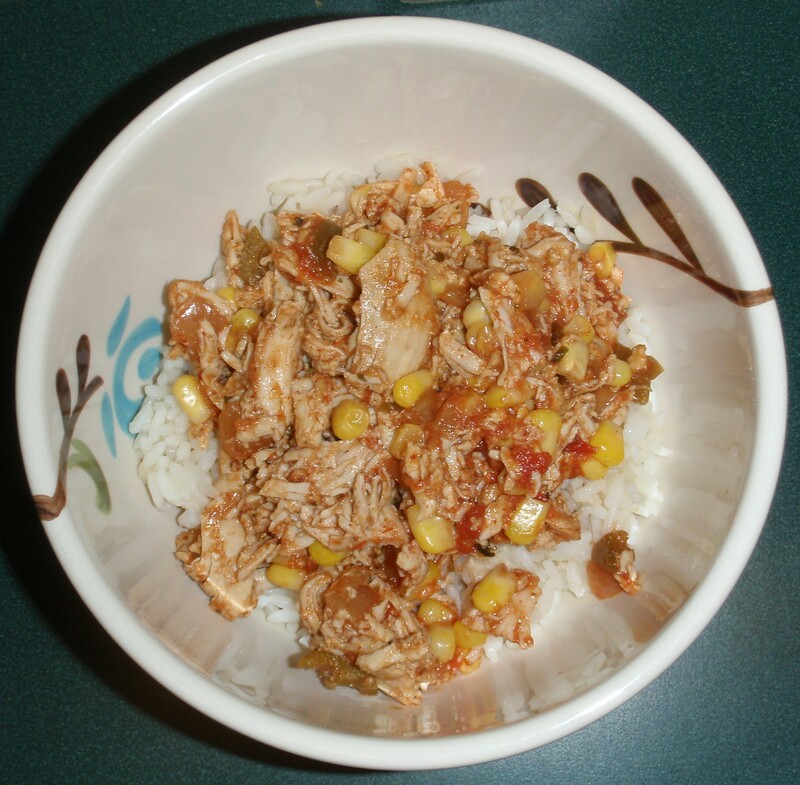 Stir in frozen corn and salsa. Cover and cook on low for 30 minutes or until heated through. During last 30 minutes of cooking prepare rice according to package instructions. 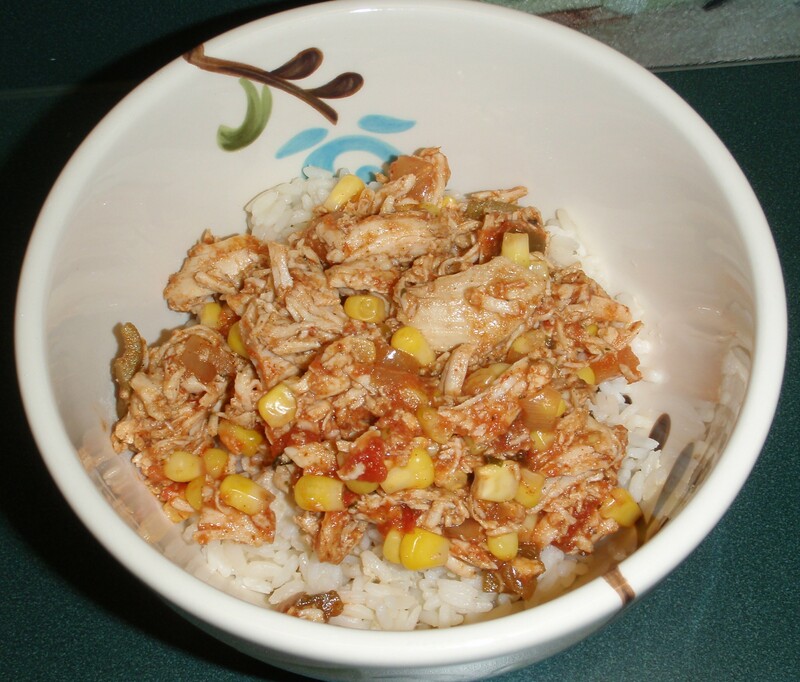 Once everything is cooked serve chicken mixture over rice in a bowl. Top with sour cream, cheese, and lettuce if desired. This dish reheats well, making it great for leftovers. The heat level of this dish is determined by the type of salsa you use. The chili powder does not add any heat/spiciness. 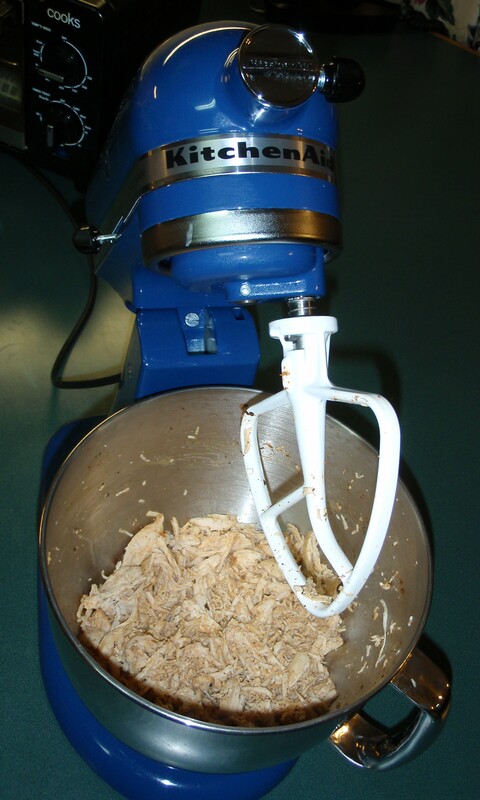 You can use two forks or a stand mixer to shred the chicken. 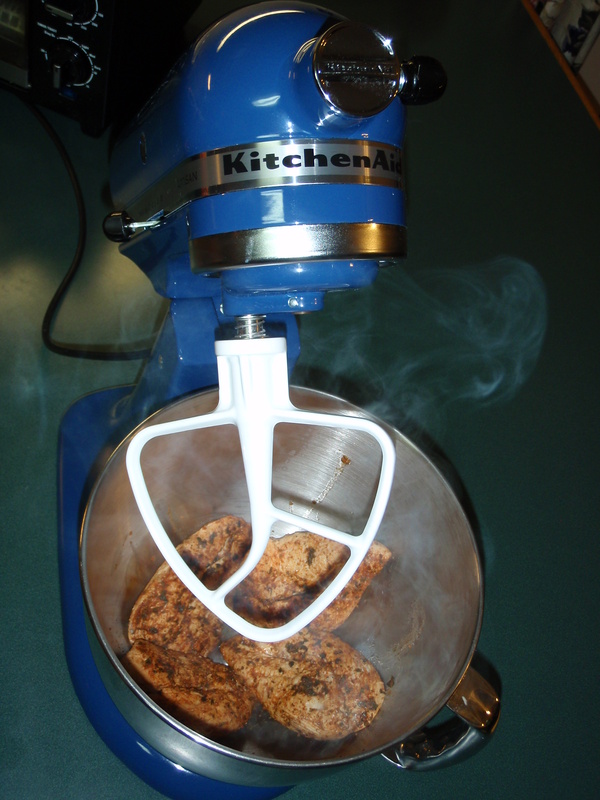 Come back tomorrow for my kitchen tip on how to shred chicken in a stand mixer! 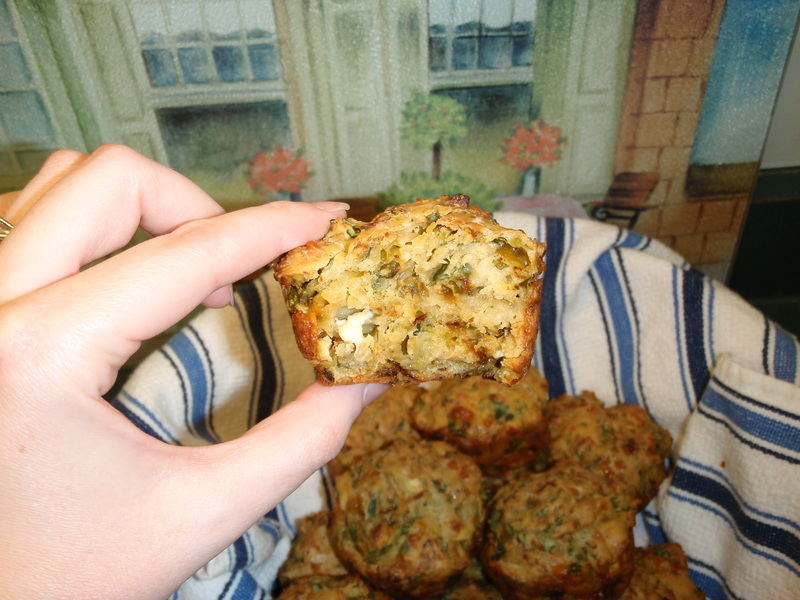 How appropriate that I am posting this yummy recipe at the beginning of summer! 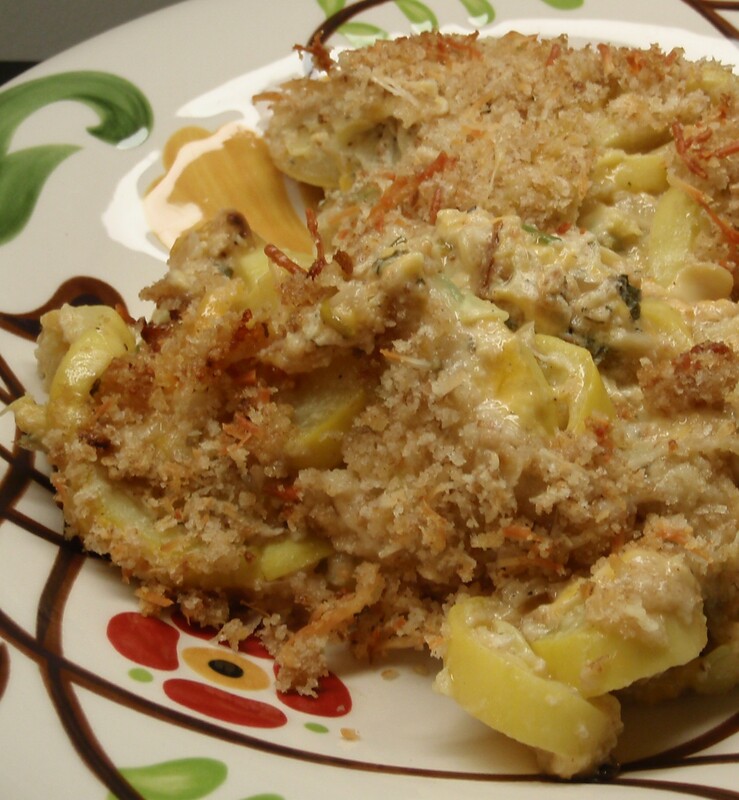 It is a great recipe for summer because yellow squash is in season. You could even substitute zucchini, which is also in season, for some of the squash. In same large skillet, melt 2 Tbsp butter over medium-high heat; add onion and garlic,* and sauté 5 – 6 minutes or until tender. Remove skillet from heat; stir in squash, 1 cup bread crumbs, ¾ cup Parmesan cheese, and remaining ingredients (cheddar through eggs) except for garlic salt. Spoon into a lightly greased 9×13 inch baking dish. Bake for 35-40 minutes, or until set. This makes 8-10 servings. I needed 2 large pots to cook all of the squash; each was about ½ – ¾ full. If using garlic powder do not cook with onions. 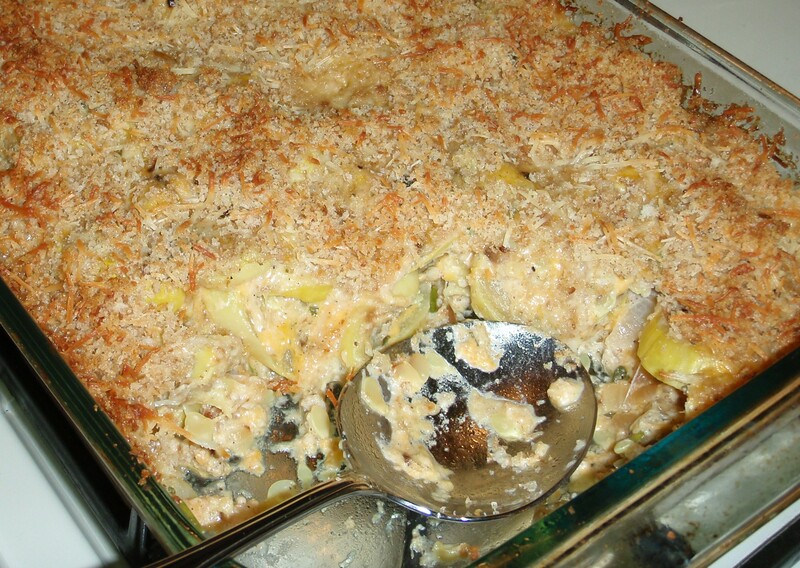 Add with parmesan cheese and bread crumbs. Q: Is squash a vegetable?